Natural hazards have the potential to cause property damage, loss of life, economic hardship, and threats to public health and safety. Hazard mitigation measures are the things you do today to be more protected in the future. They are measures taken before a disaster happens to reduce the impact that future disasters will have on people and property in the community. Mitigation reduces the risk of loss and creates a more disaster-resistant and sustainable community. Hazard mitigation measures are essential to breaking the typical disaster cycle of damage, reconstruction, and repeated damage. Hazard mitigation plans are developed BEFORE a disaster strikes. The plans identify community policies, actions, and tools for long-term implementation to reduce risk and potential for future losses. Adopted, implemented and maintained on an ongoing basis, these plans will gradually, but steadily, lessen the impacts associated with hazard events in Atlantic County. Atlantic County initiated the process for development of its initial Hazard Mitigation Plan in 2008. The County and 19 of its 23 jurisdictions opted to participate. This plan was later approved by FEMA in 2010 for 19 participating jurisdictions. View/download the 2010 version of the plan . The plan must be updated and re-approved by FEMA on a five-year cycle. In August 2014, the planning team initiated the process for the first of the plan’s formal updates since its inception. All 23 of the County’s municipalities are being invited to participate. The update was approved in February 2016. For more information please download our "Project Fact Sheet". 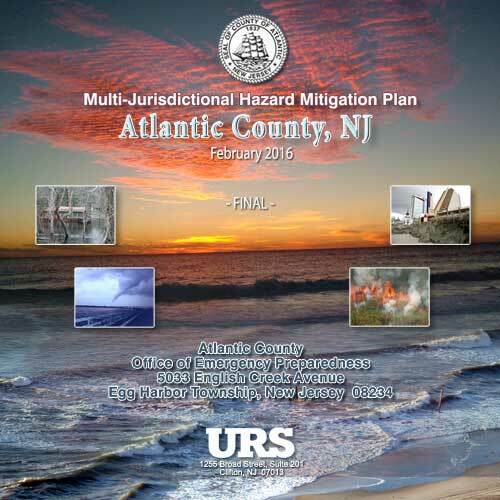 The fact sheet presents an overview of the Atlantic County Multi-Jurisdictional Natural Hazard Mitigation Planning Project.